It was nothing short of a sputnik moment for Bangladesh, when the National Economic Council of Bangladesh, headed by Hon’ble Prime Minister Sheikh Hasina, approved Bangladesh Delta Plan 2100 (BDP 2100) on 4 September 2018. The BDP 2100 aims at long-term water and food security, economic growth and sustainable environment for Bangladesh while coping with natural disasters and climate change through adaptive and integrated strategies. Hundreds of years of water-battling ingenuity that created the modern Netherlands were called into assistance while crafting this plan. As a result, an innovative collaboration between Bangladesh and the Netherlands helped to bring this plan from “planning” to “implementation” phase. Bangladesh, world’s largest dynamic delta, lies in the confluence of three mighty rivers – the Ganges, the Brahmaputra and the Meghna. The country is crisscrossed by around 700 rivers of which 57 are trans-boundary ones – 54 with India and the rest with Myanmar. The rivers cover around 4.7 million hectares area. 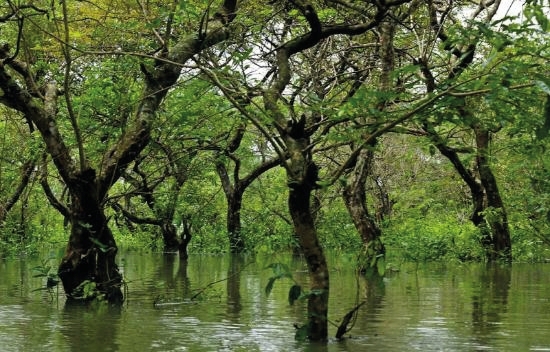 It is indeed an irony that land-starved Bangladesh loses 5,000 hectares of land to river erosion annually rendering 50,000 families landless or homeless, and 70 percent of them end up in the capital for livelihood. As opposed to this erosion bonanza, coupled with the sad irony of only seven percent of the river catchment areas within its territory, Bangladesh receives 1.4 to 2.0 billion tons of river sediment annually. All those sediments eventually discharge into the Bay of Bengal while silting up a good chunk of its rivers and canals along the way. As nearly 6,000 kms inland river transport route can be the environment-friendly and cheapest mode of transportation, Bangladesh badly needs to bring back the route for its full use as well as reclaim land through silt trapping, where feasible. Bangladesh: one of the world’s climatically vulnerable countries! Bangladesh delta lies almost at sea level along the southern coastal belt at the Bay of Bengal and rises gradually towards the north where elevation ranges from 1 to 90 meters. The lowlying delta and coastal zone shaped by the mighty Ganges, Brahmaputra and Meghna rivers is highly vulnerable, both due to the river discharges with normal tidal enhanced monsoon floods and to the regular impact from tropical cyclones. The situation aggravates due to salt-water intrusion, which affects drinking water quality and limits food production in the coastal zone. The problems are becoming worse day-by-day due to adverse impacts of climate change, land subsidence, population growth, urbanization, etc. Since independence in 1971, Bangladesh has achieved tremendous development gains across all sectors. GDP growth has reached from less than 4% in the early 1970s to 7.78% in 2018, per capita income has surged from less than US$ 100 in 1972 to US$1,752 in 2018. Foreign exchange reserve stands at around US$ 33 billion in 2018, which was only US$ 270 million in 1972. Power generation capacity reached to over 20,000 MW in 2018 from over 3,000 MW in 2009. Bangladesh has also made tremendous progress in social sectors. Poverty rate has fallen from more than 75% in the early 1970s to 22% in 2017, life expectancy has increased to 72 years in 2018. Bangladesh has achieved food self-sufficiency and the economy is gradually transforming from an agrarian-based towards a knowledge-driven manufacturing and servicebased economy. Bangladesh graduated to a lower middleincome economy from a low-income economy in 2015. In March 2018, the UN Committee for Development Policy confirmed that Bangladesh has met all the criteria to become a developing country from LDC status. To sustain the growth momentum and ensure sustainable and inclusive development addressing the adverse impacts of climate change, and appropriate land and water management, etc., a holistic longterm plan was envisioned, which culminated in the formulation of Bangladesh Delta Plan 2100. Bangladesh Delta Plan 2100: How it evolved? The Netherlands has been supporting Bangladesh in the water sector since 1960s. Accordingly, a preparatory work was conducted in 2011-2012 by a Delta Plan Preparatory Team with members from both Bangladesh and the Netherlands. Subsequently, an MOU was signed between the Government of Bangladesh and the Government of the Netherland on 22 May 2012 in Dhaka for cooperation in the field of sustainable delta management, water management, disaster management, and adaptation to climate change with special reference to the development and implementation of a Bangladesh Delta Plan 2100 (BDP 2100). The MOU had been carried forward and “The Bangladesh Delta Plan 2100 Formulation Project” was undertaken by the General Economics Division (GED), Planning Commission of Bangladesh since March 2014 with cooperation and technical assistance from the Government of the Netherlands. A consortium of nine Dutch firms and three Bangladeshi firms provided assistance to GED for developing BDP 2100. BDP 2100 has been formulated through conducting 24 baseline studies and extensive stakeholder consultations including with relevant ministries and agencies of the Government of Bangladesh. The Netherlands- Bangladesh Inter-governmental Committee acted as a guiding committee in formulating the Plan. The BDP 2100 includes a short- to mediumterm investment plan, which has been prepared with assistance of the World Bank Technical Assistance team mobilized under the Memorandum of Understanding amongst the Government of Bangladesh, Government of the Netherlands, International Development Association and the International Finance Corporation concerning Collaboration on formulation and implementation of Bangladesh Delta Plan 2100, signed on 16 June 2015 in Dhaka. The investment plan includes 80 potential programmes/projects with an estimated total cost of US$ 37.52 billion in different sectors in the areas of river dredging, navigation, water preservation, flood protection, coastal flood defense, water availability, irrigation, disaster risk reduction, climate change adaptation, agriculture, fisheries, livestock, inland water transport, etc. These projects have been prepared for implementation during 2018 to 2030. To implement the BDP 2100, a Delta Fund is under consideration with an outlay of 2.5% of GDP until 2030. The sources of the fund will include the Government of Bangladesh, development partners’ Environment and Climate Change Fund particularly Green Climate Fund, Public-Private Partnership, etc. with 80% from government’s contribution and 20% from private sector participation. Beneficiary pay principle is envisioned for the cost recovery. The biggest challenge for the implementation of BDP 2100 will be mobilizing the required fund and enough skilled manpower to implement the plan. A massive capacity building collaboration between Bangladesh and the Netherlands is expected in addition to the existing ones for the implementation of BDP 2100. The implementation framework of the BDP 2100 will entail a concrete set of investment opportunities in the short-, medium- and longterm. It is expected that this plan will unleash plethora of business opportunities for Dutch businesses as well. While taking cues from the Netherlands, Bangladesh exercised utmost caution to make this plan grounded to its own socio-economic factors and futures. In the words of Mr. Henk Ovink, famous Dutch water expert, “we need to use the future as a reference, not the past.” Likewise, considering Bangladesh’s climatic vulnerability, the BDP 2100 moored its formulation to add to its “resiliency” with a gaze beyond 2100. Therefore, the people of Bangladesh now not only have a vision to look up to, but also an opportunity to build and rebrand “resiliency” that they so rightfully deserve. This is also the essence of “Sonar Bangla” that our Father of Nation Bangabandhu Sheikh Mujibur Rahman dreamt of us as a resilient nation.